Given the current state of affairs in the world, it’s no surprise that a lot of stories set in the future depict dystopian societies. It helps too that there’s plenty of topics to explore that haven’t yet been mined for all they’re worth. State of Mind from Daedalic Entertainment is one of those games. Set in 2048 Berlin, State of Mind attempts to tackle ideas of transhumanism, and perhaps escapism. The premise is that the world, following numerous wars and constant over-exploitation of resources, is in a dire state. Technology continues to rise and innovate, with robots, self-driving cars, cybernetic implants, and even a fully-realized virtual world people can visit attempting to make life more luxurious despite the increasing dystopian nature. The game follows multiple characters (they didn’t say how many, exactly) as they explore this world and decide its future, though our demo stuck to one character, a man named Richard Nolan. Richard’s story begins in a hospital following an attack of some sort. His memory of what happened is spotty, prompting the doctors to run a cognition test to make sure everything’s still in order. That test acts as a quiz, generating images of people he knows, the doctor asking his relationship to them. It’s here we learn more about Richard: He’s a journalist covering tech for The Voice, a prominent news network; he’s married and has a kid, though they all don’t seem to be on great terms at the moment. That becomes especially clear in the next section of the demo. Having returned to his apartment and rested up, Richard wanders around trying to find his wife and child. A robot assistant they use (that Richard hates) offers to tell him their whereabouts, but he insists on checking out the apartment first. I’m given control of the demo for this section. As I walk around, the adventure game elements become clear. Most everything in the apartment can be examined, either prompting a brief bit of text or a quip from Richard. 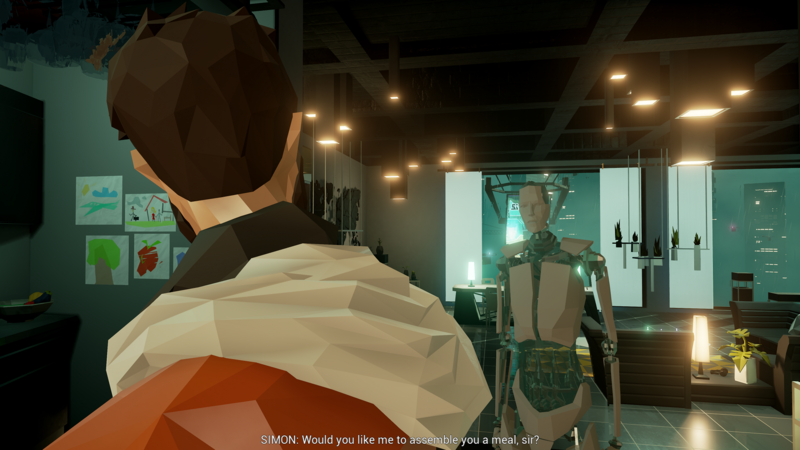 Though State of Mind is different from the usual crop of adventure games Daedalic’s known for, being a third-person adventure game instead of the point-and-click variety and going for a (quite stylish) low-poly look instead of hand-drawn art, it still feels like one of their games. He eventually gave up and asks the robot where they went. It informs him his wife took off to see her parents for the weekend, taking their son along with her, seemingly unaware that Richard had been admitted to the hospital. Following their conversation, he received a call from a woman named Lydia. Their conversation reveals they’re in the midst of an affair, Richard trying to convince Lydia to stop by given his wife’s absence. I was later told that you receive plenty of similar calls throughout the game and can decide whether to answer them or not. We’re reminded as well that your choices influence the direction of the story. Based on the demo, it’s hard to tell how State of Mind takes those choices into account, but I’m hopeful they’ll come into play in interesting ways. As the demo came to a close, the game jumped ahead to sometime later. Richard and Lydia were out in the city investigating a lead on the incident Richard was caught up in. We didn’t get to see much beyond their arrival, however, as this section of the game wasn’t quite ready to be shown, which brought our demo to an end. State of Mind is currently set for release later this year on PlayStation 4, Xbox One, Switch, PC, Mac, and Linux.